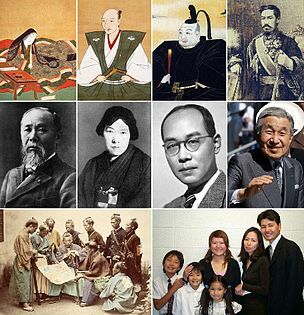 ^ Japan news, commentary, culture, sports | The Japan Times（2009年3月6日時点のアーカイブ）. Search.japantimes.co.jp. Retrieved on 2013-08-24. ^ Adachi, Nobuko (2006-05-30). Japanese diasporas: Unsung pasts, conflicting presents, and uncertain futures. ISBN 978-0-415-77035-4. http://books.google.com/?id=litYzL0GYSkC&pg=PA97&lpg=PA97#v=onepage&q&f=false. ^ 篠田謙一 (2007), 日本人になった祖先たち - DNAから解明するその多元的構造, 日本放送出版協会 、p.32. ^ 篠田謙一 (2007), 日本人になった祖先たち - DNAから解明するその多元的構造, 日本放送出版協会 、p.111-113. ^ a b c d e f g h i j k Michael F Hammer; Tatiana M Karafet; Hwayong Park; Keiichi Omoto; Shinji Harihara; Mark Stoneking; Satoshi Horai (2006). “Dual origins of the Japanese: common ground for hunter-gatherer and farmer Y chromosomes”. Journal of Human Genetics 51 (1): 47 - 58. doi:10.1007/s10038-005-0322-0. PMID 16328082. ^ Jean A Trejaut, Estella S Poloni, Ju-Chen Yen, Ying-Hui Lai, Jun-Hun Loo, Chien-Liang Lee, Chun-Lin He and Marie Lin "Taiwan Y-chromosomal DNA variation and its relationship with Island Southeast Asia. "BMC Genet. 2014 Jun 26;15:77. doi:10.1186/1471-2156-15-77. ^ Michael F Hammer; Tatiana M Karafet; Hwayong Park; Keiichi Omoto; Shinji Harihara; Mark Stoneking; Satoshi Horai (2006). “Dual origins of the Japanese: common ground for hunter-gatherer and farmer Y chromosomes”. Journal of Human Genetics 51 (1): 47 - 58. doi:10.1007/s10038-005-0322-0. PMID 16328082. "Outside of Japan D-P37.1 and its sub-lineages are extremely rare, being found in only three Korean males (D-P37.1* and D-M125*) and one male from Micronesia (D-M116.1*)." ^ Michael F. Hammer (2005) (PDF). Dual origins of the Japanese: common ground for hunter-gatherer and farmer Y chromosomes. The Japan Society of Human Genetics and Springer-Verlag. オリジナルの2006-06-25時点によるアーカイブ。. https://web.archive.org/web/20060625025512/http://www.eva.mpg.de/genetics/pdf/Japan.pdf 2007年1月19日閲覧。. ^ Haplogroup YTree v5.03 at 09 April 2017 (accessed 12 May 2017). ^ Monika Karmin, Lauri Saag, Mário Vicente, et al., "A recent bottleneck of Y chromosome diversity coincides with a global change in culture." Genome Research 2015 Apr;25(4):459-66. doi: 10.1101/gr.186684.114. Epub 2015 Mar 13. ^ Shi, Hong; Zhong, Hua; Peng, Yi; Dong, Yong-li; Qi, Xue-bin; Zhang, Feng; Liu, Lu-Fang; Tan, Si-jie et al. (October29,2008). “Y chromosome evidence of earliest modern human settlement in East Asia and multiple origins of Tibetan and Japanese populations”. BMC Biology (BioMedCentral) 6: 45. doi:10.1186/1741-7007-6-45. PMC: 2605740. PMID 18959782. http://www.biomedcentral.com/1741-7007/6/45 2010年11月21日閲覧。. ^ Jin, Han-Jun; Kwak, Kyoung-Don; Hammer, Michael F.; Nakahori, Yutaka; Shinka, Toshikatsu; Lee, Ju-Won; Jin, Feng; Jia, Xuming et al. (2003). "Y-chromosomal DNA haplogroups and their implications for the dual origins of the Koreans". Human Genetics 114 (1): 27–35. doi:10.1007/s00439-003-1019-0. PMID 14505036. ^ a b Shi Yan, Chuan-Chao Wang, Hui Li et al., "An updated tree of Y-chromosome Haplogroup O and revised phylogenetic positions of mutations P164 and PK4." European Journal of Human Genetics (2011) 19, 1013–1015. ^ 篠田謙一 (2007), 日本人になった祖先たち - DNAから解明するその多元的構造, 日本放送出版協会 、p.131-135. ^ 篠田謙一 (2007), 日本人になった祖先たち - DNAから解明するその多元的構造, 日本放送出版協会 、p.199-201. ^ 斉藤(2009) ヒトゲノム研究の新しい地平 (PDF) （2013年6月1日時点のアーカイブ）Anthropological Science (Japanese Series). 117(1), 1-9. ^ HUGO Pan-Asian SNP Consortium(2009) Mapping Human Genetic Diversity in Asia. (PDF) （2012年4月5日時点のアーカイブ） Science. 326, 1541-1545.